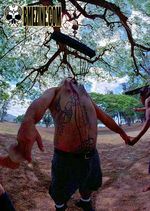 The O-Kee-Pa suspension, named after the Native American rite, is a vertical suspension hooked from the upper chest — many people have seen this ritual done in the movie "A Man Called Horse." The vertical chest suspension is considered to be the most difficult and painful suspension. Problems reported include difficulty breathing coupled with intense pain in the sternum and armpit areas. 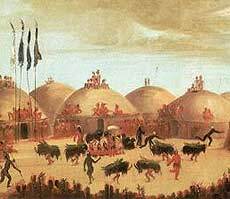 The Mandan O-Kee-Pa ("Buffalo Dance") ritual (which some people debate happened, but since this tribe was all but wiped out by smallpox in 1837 we'll never know for sure) as described by George Catlin involved dancing and sexual pantomime without food, drink, or sleep for the first four days. Then, body painted and in ritual clothing, the young warrior entered a ceremonial hut where the medicine man would cut incisions in his chest - some accounts claim "behind the muscle," but this is believed to be unlikely - through which wooden pegs would be inserted. He was then tied to rafters in the roof (or, in other accounts an outdoor, frame) and suspended, sometimes with weights attached. The warrior would then twist and swing until he entered a transcendent state. Some accounts of the ceremony finish with a self-amputation of a little finger joint. This is also considered dubious, as accounts of "primitive" rituals tend to be laden with exaggeration and prejudice, and also tend to be heavily edited to account for what the public wants to hear and is felt to be "allowed" to hear. It is important to note that many people, concerned about cultural appropriation feel that calling this suspension an "O-Kee-Pa" rather than just a "vertical chest suspension" is deeply disrespectful to Native Americans, and this name is rarely used any more unless also being used to refer to the full set of ritual and mythos that surrounds the real O-Kee-Pa. A two point vertical chest suspension is no more an "O-Kee-Pa" than drinking a glass of wine at dinner is taking communion. This page was last modified on 6 February 2013, at 06:20. This page has been accessed 59,160 times.